Come on in ! 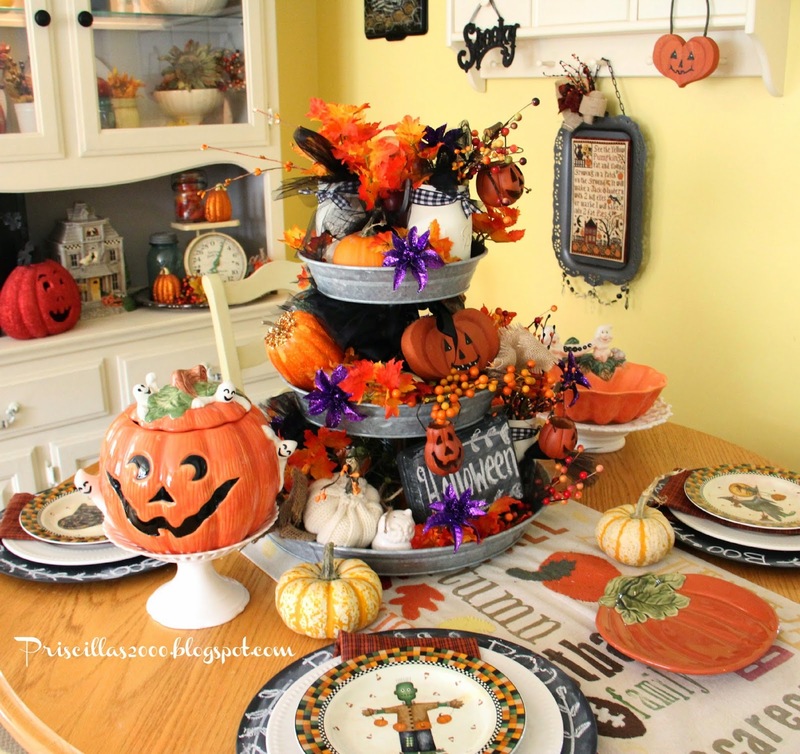 !It's time for Halloween in the kitchen ! I am not into the blood and guts type of Halloween , more the fun and whimsical ! The table is set ! A Fitz and Floyd pumpkin and bowl are on display..
And now for my all time favorite Halloween stitching ..I couldn't find a frame to fit or anything to mount this Prairie Schooler Pumpkin Patch onto.. I was in Hobby Lobby and in the Christmas section there was this hanging metal tray. It was red with a design on it . So we spray painted it ! I used a magnet to mount the stitching to the tray just in case I want to use it for another stitchy project ! My son spray painted the tray for me and on accident he got some of the beads on the bottom .. I love how it looks ombre'! I added a burlap and homespun bow to the top chain and a berry pick.. 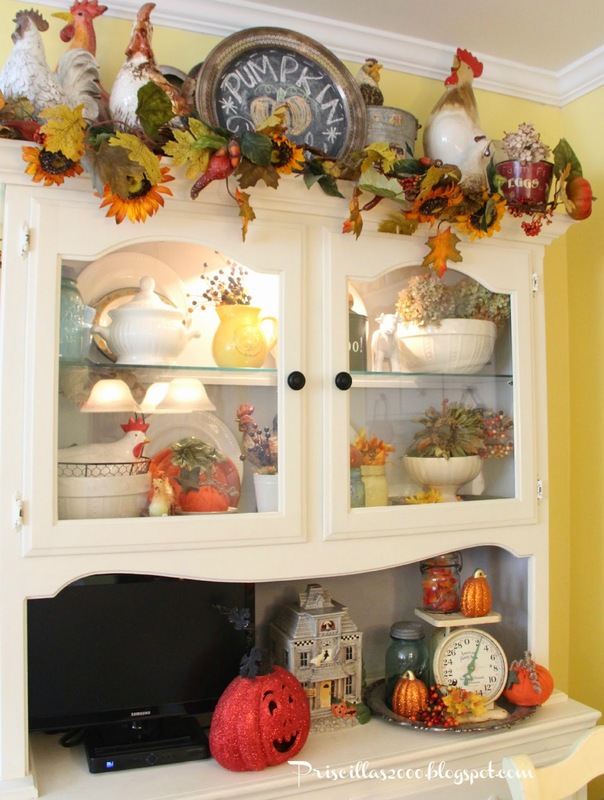 The roosters on top of the chalk painted hutch are surrounded with an autumn garland and a silver thrift store tray painted with chalkboard paint. The haunted house cookie jar on the hutch is from Debbie Mumm ..Old,Old,Old ! 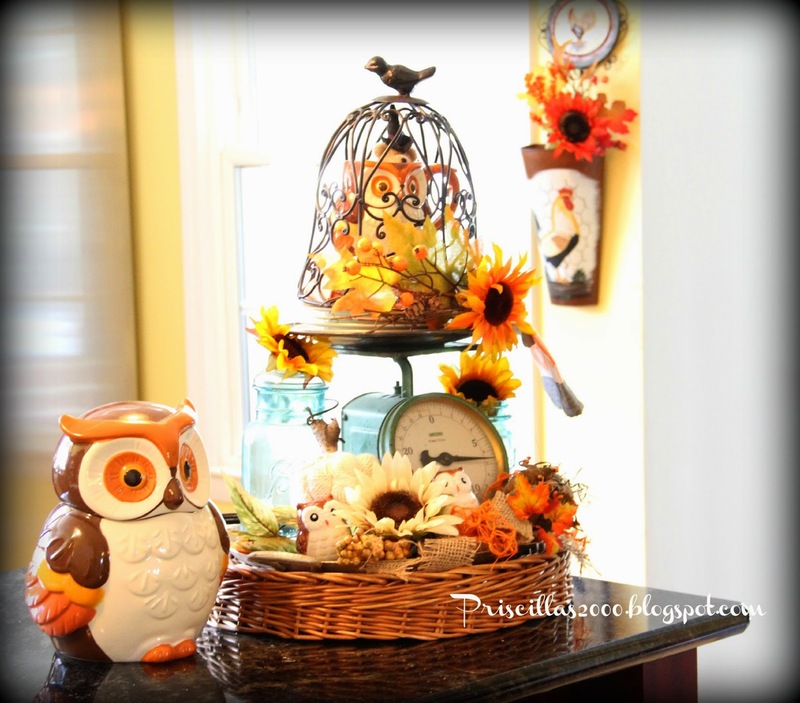 I changed up the vintage scale vignette a little with some owl salt and pepper shakers from BHG at Walmart .. There is a little witch sticking out of the owl mug.. 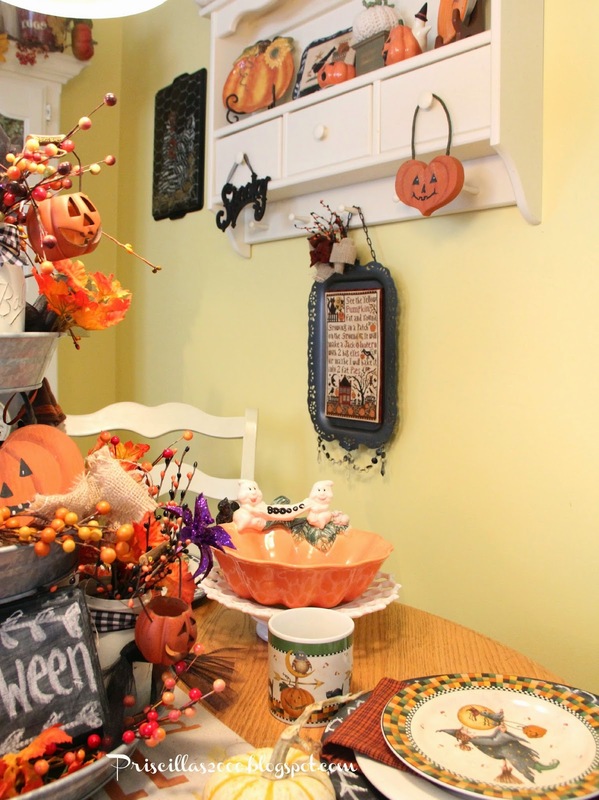 The dining room got some Halloweening too .. I will be back in a couple days with that ! Debbie Mumm dishes, on top of Dollar Store plates and chargers that I painted with chalkboard paint. I can't even tell you how much I love that stitching on the tray ! Thanks so much for stopping by ! I would love for you to follow me on Instagram, Facebook and Pinterest ..all the links are in the sidebar ! I love the bursts of color that you have going through the room. Just wonderful! 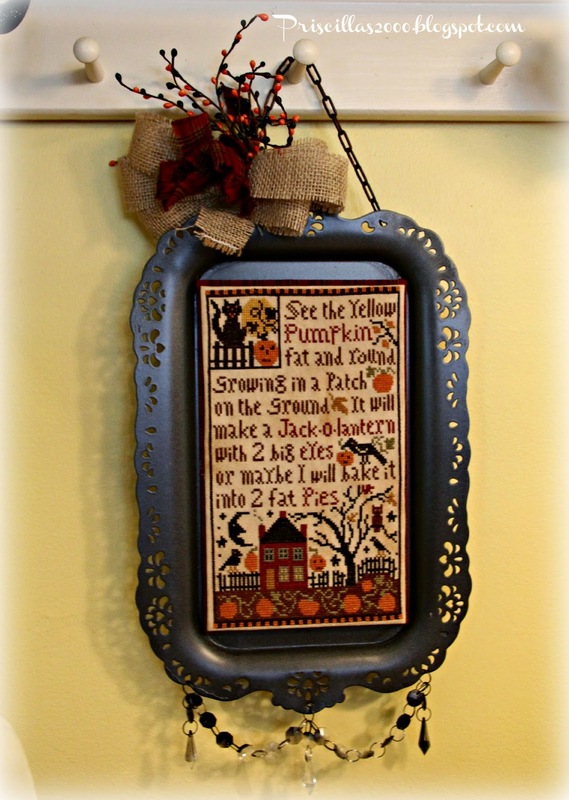 You find so many clever ways to display cross stitch! It all looks fantastic!!! Love how you finished the PS Pumpkin Patch, its just perfect. I love the orange and blacks of Halloween they just go so well together, don't they. I know Halloween is much bigger in the USA, than here in UK, but there just doesn't seem to be many decorations out here yet??? Christmas yes, loads, but not so many Halloween, or maybe I'm not looking in the right places, lol!!! 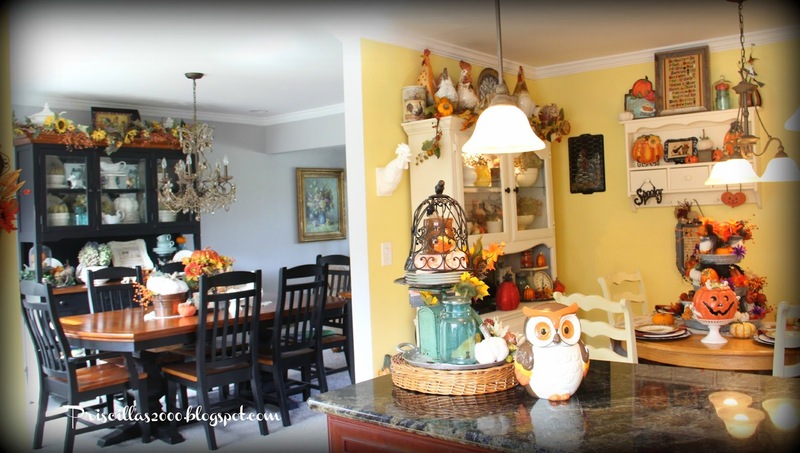 Love your kitchen and love how overdone it is! It makes me so happy because I always try to squeeze in more things each year as I find more fun things to make! What a fun room you have created! I love a happy and cheerful Halloween. One without all the blood and guts. Your room is charming! Oh my! I love everything you've done! Love those chalkboard chargers and the silver tray on top your cupboard. And how clever to display your stitchery on that metal tray! 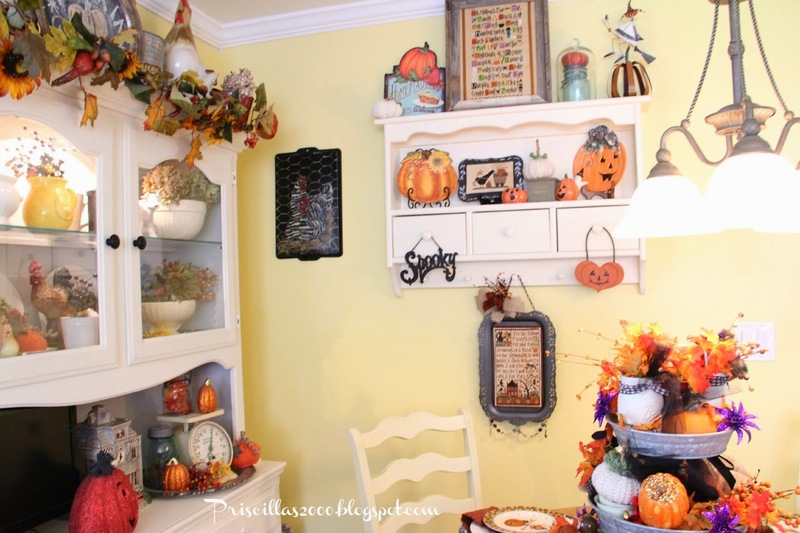 You are such a decorating inspiration! 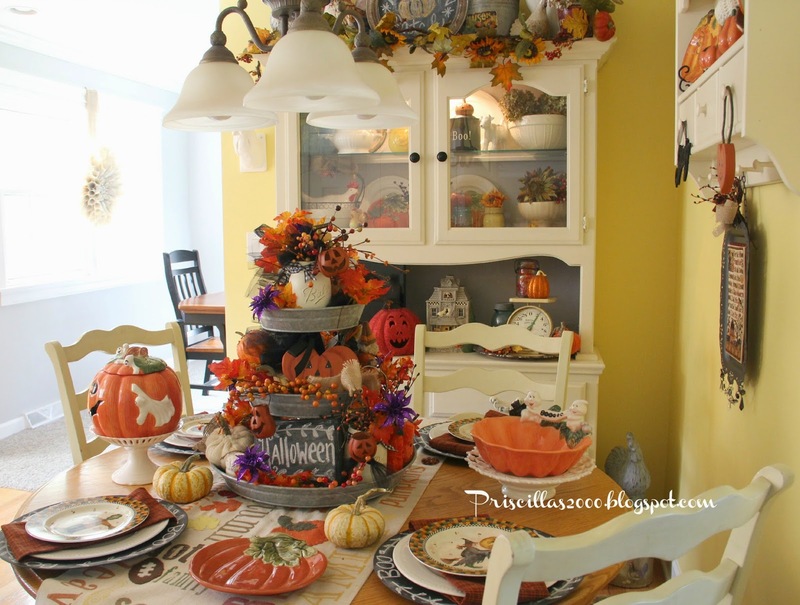 Beautiful fall touches...I am loving it! It all looks great! 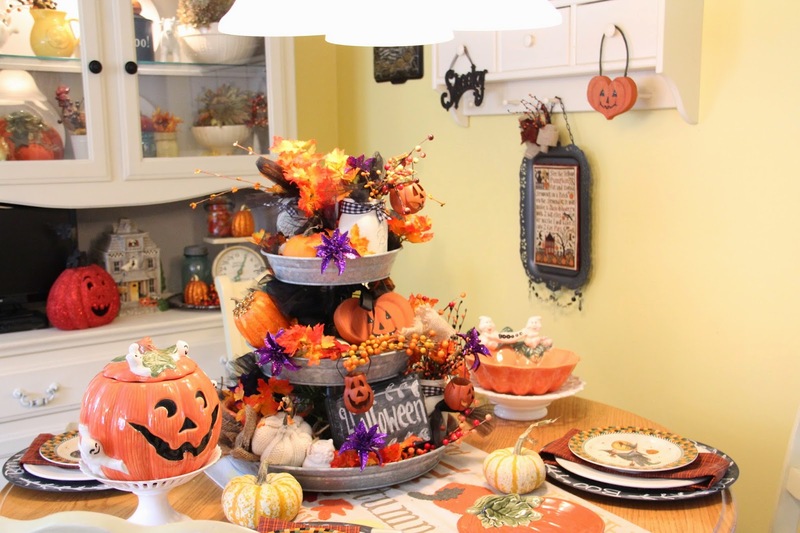 My fav parts are the tiered galvanized stand full of all kinds of Halloween fun and the way you used the tray for the needlework! 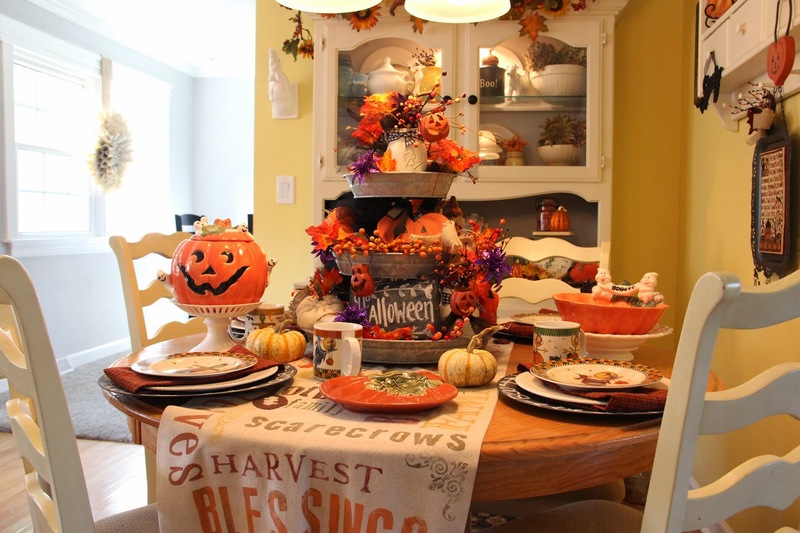 Your entire home is so festive Priscilla! Love your cute chalkboard art and the tray is perfect for your stitch work. Love it! Thanks for sharing with SYC. Oh my goodness, what a fun looking kitchen. I could sit and look at it for hours, just too cute. Love it! I really like how you mounted your cross-stitch piece in the metal tray, very inventive. 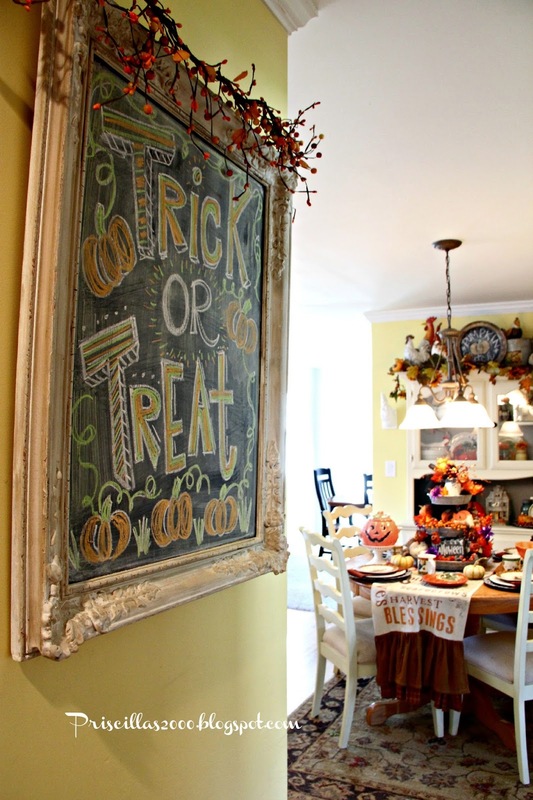 Your chalkboard is neat as can be, as well. Just love the entire room.